LexisNexis is a leading provider of authoritative legal, news, public records and business information; including tax and regulatory publications in online, print or CD-ROM formats. As director of USD’S Paralegal Program for the last 25 years, I am most proud of the excellent reputation of our program in the legal community. That reputation is a result of the excellent caliber of our students and graduates, the faculty who teach them, the hard-working Alumni Association, the dedicated USD staff, the Advisory Board and the satisfaction of hundreds of employers who have benefited from our well-prepared professional graduates. "Freelance, Independent, Contract" Paralegals - all are essentially the same: individuals who are self-employed and offer their services to attorneys on a short-term or long-term basis. The Honorable Justice Richard Huffman has been Chairman of the USD Paralegal Program Advisory Board and Curriculum Advisor for the past 15 years. In September of this year, the University of San Diego Paralegal Program, in conjunction with the San Diego Paralegal Association and other paralegal programs, will host a joint meeting with students and practicing paralegals. Not just your average law library, the Pardee Legal Research Center (LRC) on campus at the University of San Diego is the region's "premier legal collection and facility." Each semester, more than 50 interns are placed with local firms and businesses. The internship program is a required component of the Day Program at the University of San Diego. 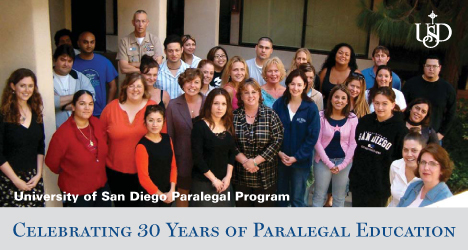 Some of San Diego's largest firms have been employing USD paralegals since the early 1980s. Firms such as Luce, Forward, Hamilton & Scripps LLP and DLA Piper Rudnick Gray Cary contact the program office when seeking qualified paralegals. As a free service to both employers and graduates, the University of San Diego Paralegal Program facilitates the connection. Although we think of the paralegal profession as somewhat "new," the American Bar Association endorsed the use of paralegals in 1967 and established its first committee on paralegals in 1968.